Tonight, I went with a friend to try out Bamiyan Kabob. 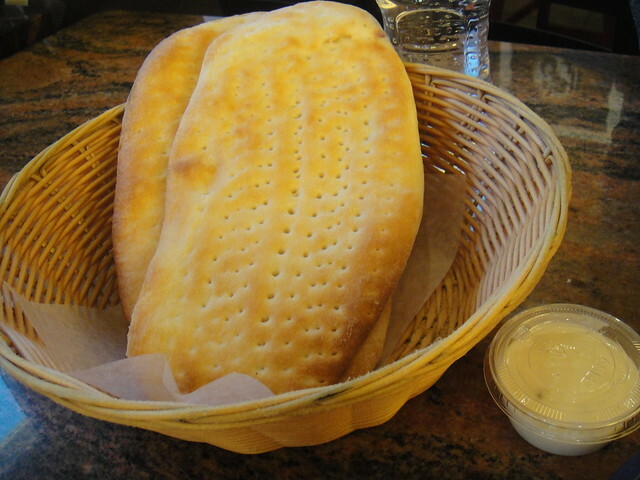 It is a popular place to eat Middle Eastern food as evidenced by both the current #2 restaurant ranking in the Markham area on Urbanspoon and also immediately when we stepped foot into the restaurant. We were actually surprised to realize that it was not a sit-down and dine-in restaurant with servers, but rather it was a pay-for-your-meal and grab-a-table-and-start-eating kind of place. We were still very excited to try it out though, and ordered two dishes to share that we had heard were popular and delicious. 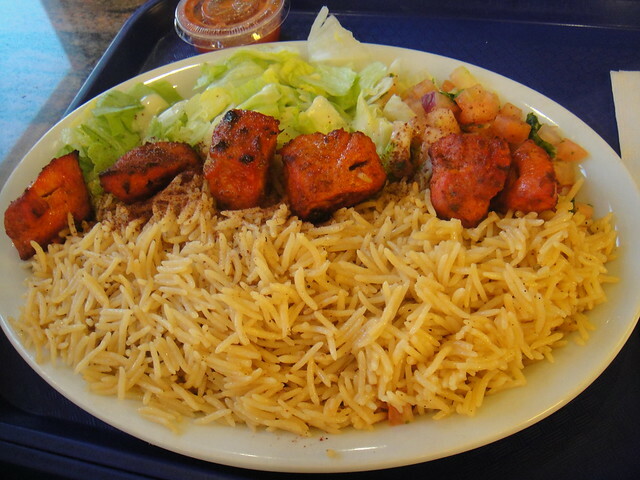 They specialize in different kinds of kabobs such as chicken, lamb, and beef cooked in a “Bamiyan” fashion. I loved their chicken. It was very tasty! Also, their rice was delicious as well! 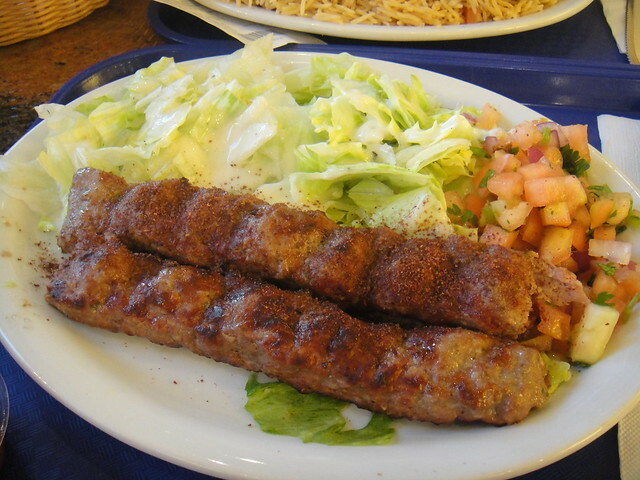 -2 skewers of lean ground beef marinated in fresh grated spices and seasoning. The beef skewers were very good; they were a little spicy, but still very well flavoured and soft. I liked the chicken better in the end. The salad, Bamiyan Mista (fresh tomatoes and Bermula onions, tossed with natural herbs), was very fresh. It was a good and delicious meal worth around $10 each. It was a little noisy to carry a good conversation since there were so many tables and lots of in and outs. There were also lots of people ordering take-out. Once you’re done eating, you carry your tray of finished plates to the station to dispose of your own trash. There was a couple waiting on our table when we were nearing the end of our last bites. Many families with small children filled the tables and the majority of the patrons were of Middle Eastern descent. The restaurant is located in the Markham Road area where there is a large Middle Eastern population. Aside from this Markham location, they also have several other locations in the GTA. Would I return to this restaurant? Probably yes, and probably if I’m in the area for some yummy and good quality Afghan Halal food. 🙂 Oh, and next time I would probably get their mango smoothie as well. I saw the table next to us ordering it and it looked pretty substantial! This entry was posted in Food and tagged Afghan cuisine, Afghan food in Markham, Afghan naan, Bamiyan Kabobs, Bamiyan Mista, first time trying Afghan food, food, food blog, foodie, Kofta Kabob, Markham, Middle Eastern cuisine, popular, restaurant review, Tandoori chicken kabob, where to eat Afghan food in Markham. Bookmark the permalink. Haha, yep! I figured I might as well do it as soon as I got home lol. The food looks so gooooood!